While I am satisfied with another line in thicker diameters (over 0.285mm) it isn't available in the lower diameters I want for perch, roach and so forth. 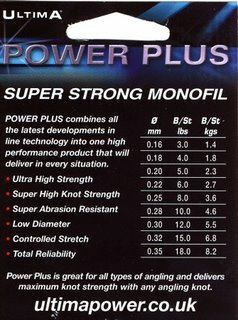 This is where Ultima Power Plus comes in. It is not a particularly exciting line (if lines can be exciting). 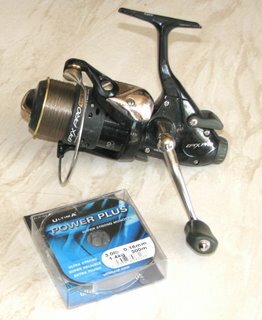 It is not super-limp, but is nowhere as near as wiry as other 'economical' monos and performs well on the reels with little twisting. 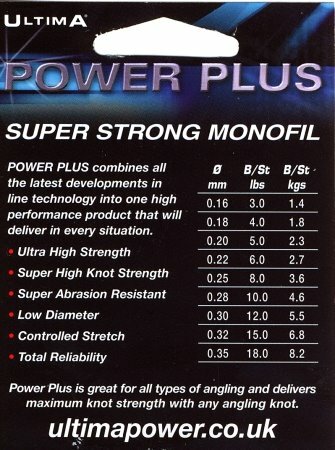 In fact it is a pretty bog-standard mono which has proved reliable - even when daft c*rp have been hooked - which is all you need from a main line. The colour is a pale olive green.